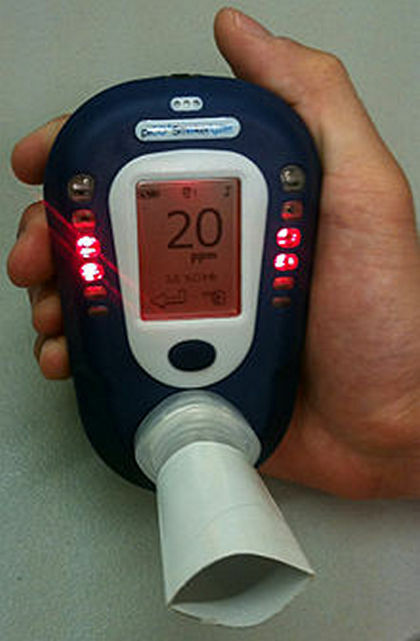 I'm writhing this article, not to scare anyone but to warn pilot of the dangers of carbon monoxide poisoning. In my flying career I have heard many claims, including the fact that carbon monoxide is colorless, odorless ant tasteless. However, I figured that if it comes out of the exhaust, I'm pretty sure I'll smell it. Well then, let me tell you about my experience and what a wakeup call it was! I was asked to test fly an aircraft after a total rebuild and engine transplant. The aircraft was a Vixen Boriann. A two seater, LSA aircraft manufactured of tube and fabric and fitted with a Rotax 582 engine - very similar to the Kitfox or Bushbaby. I did my usual inspection as I do on any test flight. I found a few minor things that I had asked the owner to change/repair. One of these were 4 or 5 small holes in the firewall, which were there as a result of the engine transplant. Obviously, one can expect that there'd be a few differences in the installation of the new engine, perhaps wiring or fuel lines in slightly different places. In this case, there were a number of new holes made and some old ones left open. I asked for these to be closed up, as I'd always heard of this deadly poison possibly seeping into the cockpit through a hole in the firewall. The mistake I made was not checking that this was done properly. On this engine installation, as in all Rotax engine installations, the exhaust system has knuckle joints. It's a type of joint where two parts of the exhaust fit into each other and held firmly in place by three springs under tension. This system is to avoid cracking in the exhaust system due to vibration and as far as I'm concerned, works very well. Only problem is, there is a very small possibility that a small amount of exhaust gas (Carbon monoxide) could leak at these joints. Not really a problem, provided that this gas doesn't get into the cockpit. Once the gas exits from the engine cowl, it dilutes into the atmosphere just like any other car or aircraft exhaust. But I forgot about those few small holes in the firewall. During the test phase, I did several high speed taxi runs where I applied full power and accelerated up to takeoff speed, reduced power and came to a full stop before the end of the runway. I did this to determine the takeoff point of the particular aircraft and whether I'd be able to land back on the runway in the event of some problem. In this case, the aircraft attained flying speed in a very short distance - less than 25% of the runway. After completing about 10 to 15 high speed taxies, holding the nose wheel off the ground but reducing power so that the main wheels remained on the ground, I was ready for the first hop. I took full power, reached rotation speed, gently lifted the nose and got off the ground; then immediately reduced power to maintain about half to one meter above the runway. At the halfway mark, I closed the power, set the Vixen down and came to a stop well before the end of the runway. I repeated this about 10 times, each time stretching the airborne distance a little further. With each hop, I also tested movement and effectivity of controls to ensure a proper level of maneuverability during flight. There were two small issues that needed attention; one was the brake pulling to one side and the other was that I couldn't trim to fly neutral. I stopped the testing and attended to these issues. Up to that point, I had clocked over an hour of testing and hadn't noticed anything untoward on the engine and exhaust system. A day or two later, with perfect flying conditions, I resumed the testing. One or two high speed taxies, then a hop, landing again before reaching the end of the runway. A few hours later, I was satisfied that the brakes were working as I wanted. I could now also trim the aircraft straight and level, flying just above the runway. And she was reacting positively to any and all of my control inputs, I decided it was finally time to do the first flight. I had now clocked up another hour of hops and tests and had happily negated any ideas of possible carbon monoxide leakage in the cockpit. I lined up on runway 26, made decisions as to which points on the runway I could still land, and at which point do I go for the field just northwest of the runway. Up until this point, I had no reason to believe that the engine would let me down but better safe than sorry. It's standard practice with me to be aware of all my options before takeoff on every flight. Happy with all my safety checks, I applied full power, accelerated very quickly to flying speed and I was airborne. I did my after takeoff checks and maintained runway heading, swiftly climbing at over 1000 ft/min - an ideal climb rate as it gave me more options in case of an engine failure. I got to circuit altitude before even turning crosswind. At this point, I reduced power, turned out right and trimmed for straight and level flight. At FAKR, we operate under Lanseria TMA and are restricted to 800 ft. AGL, otherwise I would have climbed even more. I had now established a right hand circuit pattern at 800 ft. AGL. All the time monitoring temps and pressures, also giving control inputs and trying different flap settings. Everything seemed normal and the plane handled exactly as expected. I even slowed down to just above the stall speed and still maintained full control on all three axes. I had probably been in the air for well over half an hour by now. I had completed at least 4 or 5 high altitude (800 ft. AGL) circuits before deciding that it was time for a touch and go. Set up on downwind, I did all my checks, then turned base followed by my base checks. Now final approach. Conditions were absolutely perfect. Hardly any wind, visibility perfect and only two other aircraft in the vicinity approaching the airfield. Final checks and touchdown - all smooth as could be. "Okay", I thought - apply power, check speed and rotate. Now something strange happened�. The horizon went a little blurry and I couldn't quite make out the sound of the engine; but I could feel the thrust and I was still climbing. I don't remember reducing power or turning crosswind and downwind. But I do remember on downwind that if felt like I was out of breath. I remember putting my hand over the vent in the door and I clearly remember thinking, "why is there no air coming through the vent, even though it's open". I continued the circuit and did another touch and go. All seemed okay until I lifted off again. This time I remember losing sight of the horizon completely after it first went blurry. Again, the engine went quiet but I kept climbing. By the time I got onto downwind, I was now very short of breath. I checked the vent again and then decided to open the door. The latch on this door is so simple. It's a lever about 5 cm long that you swivel 90 degrees and the door opens easily. I can't explain this but I couldn't figure out how to open the door. Maybe a good thing as I don't know what would have happened, had I got it open. I now decided that it was time for a full stop landing. I have no Idea what happened to the other two aircraft but when I spoke to them afterwards, they told me that they had joined the circuit with me. They didn't notice anything strange and that I had communicated with them on the radio - even though I had no recollection of making radio contact with anyone. I had now turned base and finals. Although I knew that something was wrong, I had no idea what it was. I had now lined up on short finals and was concentrating hard to maintain control. Here comes the scary part�. I must have done over 1000 landings on this runway before and I had done two in the past half an hour. But what my hallucinating eyes were seeing, was a bizarrely placed fence across the runway! It looked so real and so high that I almost performed a go around to avoid it! In fact, so real was this imaginary fence to me, that I did apply power to get over it, but then managed to land deep on the runway - thankfully, without any problem. I also remember managing to get the door open, the second that the wheels were on the ground. It was a relief as I was able to breath freely. But I had developed an instant headache. This was also something strange as I never get headaches. I remember taxing up to the hangar and when I got out of the aircraft, I asked about the idiot who put up the fence. I got some very strange looks but no replies. I don't remember putting the aircraft away but I must have done that as it was safe in the hangar when I got there the next morning. I know that I spent some time with the regular guys at the airfield afterwards but don't remember much of what we spoke about. Other than the headache, I felt just fine. Once I got home, I went to bed and fell asleep. I woke up very early the next morning feeling very nauseous. Ran to the bathroom and vomited. Once this was over, I felt better again. I had a shower, got dressed and went off to the airfield like every other morning. Once I got there I started feeling flu-like symptoms. 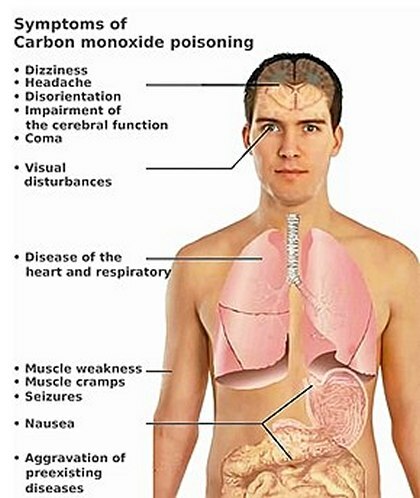 I called the doctor, made an appointment and, to my utter astonishment, was diagnosed with CARBON MONOXIDE POISONING! That was not the end of it - I spent a miserable week in bed with the worst muscle pains ever - something akin to tick bite fever, even hemorrhaging through the skin on my legs, which were unbearably painful to the gentlest touch. It was during this recovery period that the full impact of the very real and present danger of succumbing to carbon monoxide poisoning dawned on me! Definitely not something that can be taken for granted but is often ignored in the most thorough of pre-flight checks. Once I had recovered, I went back it inspect the aircraft. I then found the holes in the firewall that had not been repaired. Also found evidence of a leak at one of the knuckle joints on the exhaust system. We closed up all the holes and repaired the exhaust. I then purchased a carbon monoxide detector and flew the aircraft for several hours afterwards without any trace or problem. And this is only my personal opinion gained from doing some research and trying to remember everything that happened. #	During my first inspection of the aircraft, I found things that needed to be corrected. I should have checked these again and again to be 100% sure that what I wanted done was done. You can never be too cautious. As a test pilot or just Pilot in command of any aircraft, you have the right to check and question anything and everything. #	The reason for the carbon monoxide not affecting me during the initial phase of high speed taxies is probably that there wasn't enough of an accumulation of the gas, or the pressure in the engine compartment hadn't built up sufficiently to force the gas through the holes in the firewall. Remember, I had never exceeded rotation speed at that point. The higher the speed, the higher the pressure. #	The shortage of breath, I haven't been able to explain. Other than the natural instinct of the human body to acquire oxygen. #	The air not coming in through the open air vent. One of two things could have caused this. Either the pressure of the air/gas mixture being forced through the holes in the firewall was equalizing the pressure from outside the air vent or my directional control of the aircraft was that bad that flying with the ball out could have neutralized the pressure on the outside of the vent. However, when I flew the aircraft the next time after doing the necessary repairs, the vent worked perfectly. #	The horizon going blurry, the engine going quiet, the door latch that didn't work. Either I was semi-consciousness or I was hallucinating. #	The fence across the runway. This one puzzled me for a long time. The only explanation I can come up with is this. There is in fact a fence about 100 meters short of the runway threshold. But due to a very high embankment on which the runway is built, the top of this fence is at least 3 meters below the level of the runway. I asked several spectators about the fact that I had to climb to clear the fence on short final but no one could shed any light. Most of them said that it was a lower than normal approach. I can only put it down to hallucination. Part of my safety pre-flight routine now includes ensuring that my carbon monoxide detector is in the cockpit, especially on any test flights. My strongest recommendation to ALL pilots is GET ONE and use it, irrespective of how well you know your aircraft and how often you've flown it. It's a small price to pay for averting potential disaster. Happy landings and fly safely!